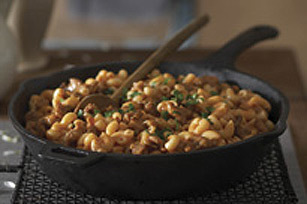 This sausage and pasta skillet recipe is what we refer to as a weeknight winner. Ready in 20 minutes, this pasta recipe is quick, easy and uses only 5 ingredients! Meanwhile, crumble sausage into large nonstick skillet; cook on medium heat until done, stirring frequently. Add soup and Cheez Whiz; mix well. Cook 5 min. or until heated through, stirring frequently. Drain pasta. Add to sausage mixture; mix well. Sprinkle with parsley. Substitute 1 cup chopped wieners or pepperoni for the cooked Italian sausage. Mix with soup and Cheez Whiz in large nonstick skillet; cook 5 min. or until heated through, stirring frequently. Continue as directed.